Unlike agriculture – which deals with large-scale production – we focus on high-value crops where every plant matters. You will learn best management practices, including integrated pest management, for conserving and protecting valuable natural resources. Prepare for a science-based entry-level position in the rapidly advancing and diverse horticulture industry with our 31-credit hour Horticulture Sciences certificate. 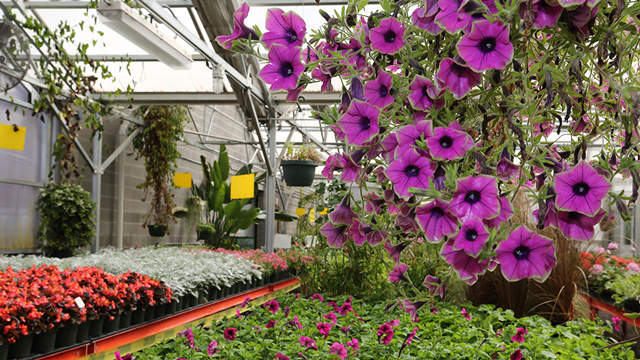 Or complete JCCC’s Associate of Applied Science in Horticultural Sciences over four semesters (61 credit hours), then transfer to Kansas State University or be ready to take a management position in the horticulture industry. Pursue the Honors path to explore in greater depth any areas in which you are interested. Commercial Pesticide Applicator. Take Pest Management (HORT 255) to prepare you for the applicator of restricted horticultural pesticides (RUPs) certification exam. Certified Arborist. Enroll in Arboriculture (HORT 165) to help you succeed in the Arborist Training Course to become a certified arborist in Kansas. Be part of the only program of its kind in the Kansas City area. Unique courses and mix of science and technology give you the foundation you need for a future in any number of careers. Eighteen of the 19 core courses have hands-on laboratory projects in the greenhouse and the field. A flexible schedule offers face-to-face, online and hybrid courses during the day, evening and on Saturdays. The Horticultural Sciences certificate is stackable with the Associate of Applied Science in Horticultural Sciences. Involvement in the Horticultural Sciences Student Association (HSSA) helps you build leadership and interpersonal skills while you grow and sell plants to support Horticultural Sciences scholarships. You finish your degree with a capstone internship (HORT 270) that often leads to a full-time career in the industry. You can transfer many of your JCCC credit hours to Kansas State University to pursue a bachelor’s degree or even a master’s degree. Plants will also be sold from noon to 4 p.m. on Saturday, May 4, and there will be a special sale during Cav Craze on Wednesday, May 15, from 10 a.m. – 2 p.m.
All plants are grown from seeds, cuttings and plugs and lovingly tended by students in the JCCC greenhouse. Proceeds benefit the Horticultural Sciences scholarship fund. Payment by check preferred. No debit or credit cards, please.